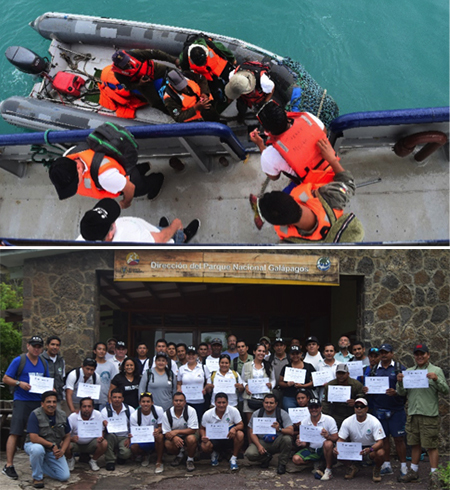 Among the training modules were a series of scenarios that involved law enforcement boarding fishing vessels engaged in potential illegal activity. Boarding a suspicious vessel can be extremely dangerous: Illegal fishermen can become violent, and if drugs are being trafficked, the crew may possess firearms. We train rangers how to identify suspicious actions when approaching a vessel, how to interrogate the crew and how to conduct crime scene investigation strategy, among other core procedures. Patrolling such a vast reserve presents a significant challenge for park enforcement officers. The good news is that the Ecuadorian navy and the Galápagos National Park Service possess sophisticated electronic monitoring systems — in large part due to foreign assistance and in direct contrast to many marine protected areas throughout the developing world. WildAid currently is integrating electronic monitoring sensors, crafting standard operating procedures for key maritime vigilance activities, delivering annual refresher courses and planning to carry out performance-based patrol vessel acquisitions in cooperation with the Galápagos National Park Service. We’re also looking into the use of unmanned aerial vehicles (UAVs, or drones) to carry out perimeter scans of the reserve, or to be sent where there is suspicious activity. For example, the presence of a large vessel outside of the reserve could be viewed via what’s known as a vessel monitoring system. But determining whether or not such a vessel is waiting for smaller boats illegally fishing within the Galápagos reserve would require the use of a UAV. Students of our course were incredibly enthusiastic about the training — these men and women on the frontlines of conservation are genuinely dedicated and focused on protecting Ecuador’s marine environment. Read more about the Galápagos Marine Reserve here.